There is no time to waste. You and three other members of your team has a clear goal: to rid the area of all enemies. It will not be easy. Choose from three difficulty levels, which take place in five different areas, including winter camp. Show your shooting skills and your reflexes. Have fun!. Your goal is go through the landscape and your mission ends until when all soldiers will dead. Except your own, of course. Hit all of them will not easy, you will not fight only against pawns, but also against snipers. Some enemies are moreover cowardly and will hide before you. You will have to find these soldiers. Can you manage that? 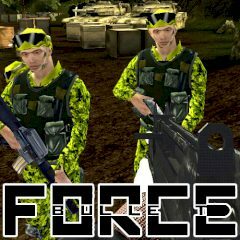 The game Bullet Force brings you great opportunity fight in three various difficulty levels in five different environments including a winter camp. Whether you are an expert, or a rookie, click the button and start play. Have fun.